The copyright for each essay on this page belongs to T.J. Stiles. No reproduction without permission of the author. 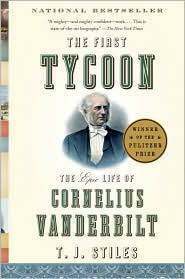 On April 21, 2009, Alfred A. Knopf, Inc., published The First Tycoon: The Epic Life of Cornelius Vanderbilt, by T.J. Stiles. This biography offers a sweeping new account of the business career and personal life of the Commodore—as Vanderbilt was known—the first great corporate tycoon in American history and the founder of the Vanderbilt dynasty. Of all the key industrialists and financial figures of American history, Vanderbilt may well be the most important. Yet, unlike Jay Gould, J.P. Morgan, John D. Rockefeller, and Andrew Carnegie, the Commodore has never received a full and authoritative biography. The First Tycoon weaves some six years of intensive research (in previously untapped archives) into a fast-paced story of a man and the nation rising together. Ranging from his humble birth on Staten Island during the presidency of George Washington through the days of John D. Rockefeller (with whom Vanderbilt made deals), The First Tycoon recounts Vanderbilt's rise from sailboat ferryman to steamboat entrepreneur, from master of transoceanic steamship lines to builder of a railroad empire. Along the way, Stiles describes Vanderbilt's personal adventures in the Nicaraguan jungle, his epic campaigns on Wall Street, and the intrigue that divided his family. Most important, Stiles shows how Vanderbilt helped to shape American thinking about equality and opportunity and create the modern economic world. "This eminently readable and engaging biography of the richest man in the first hundred years of the United States' independence is a landmark study that significantly enhances one's understanding of U.S. economic history. . . . What makes this book truly remarkable is the author's breathtaking grasp of history; as Stiles comes to grips with contemporary essayists such as Charles Francis Adams, who wrote on Vanderbilt, one realizes that his ability to integrate economic, technological, intellectual, and political history makes him one of the most exciting writers in the field." "This is a mighty — and mighty confident — work, one that moves with force and conviction and imperious wit through Vanderbilt’s noisy life and times. The book, The First Tycoon: The Epic Life of Cornelius Vanderbilt, is full of sharp, unexpected turns. Among the biggest: Mr. Stiles has delivered a revisionist history of American capitalism’s original sinner, the man who inspired the term 'robber baron.' He has real sympathy for the old devil. "The phrase 'epic life' is a biographical cliché. But it fits Vanderbilt in every regard: force of personality; degrees of ruthlessness, guile and accomplishment; even sheer life span. 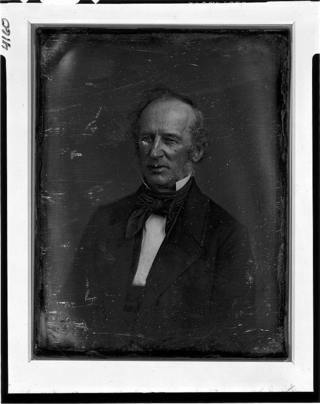 He was born less than two decades after the end of the Revolutionary War, while Washington was still alive, and he would live long enough not only to play a significant role in the Civil War but also to do business with John D. Rockefeller. . . .
"Mr. Stiles gets Vanderbilt the man onto paper. He is eloquent on Vanderbilt’s love of horses and horse racing, his tangled relationships with his 13 children and his dabbling in the occult. . . . He is even better on Vanderbilt's fraught relationship with New York society, which at first shunned him as 'illiterate and boorish.' . . .
"I read eagerly and avidly. This is state-of-the-art biography, crisper and more piquant than a 600-page book has any right to be." "Cornelius Vanderbilt, the Staten Island farm boy who rose to become America's transportation king, was the richest man of his time, but terms like 'richest' don't do him justice. In 19th-century America's untaxed, unregulated Wild West style of finance, his grip on the economy was so complete as to be barely comprehensible by today's standards. . . .
"Stiles, a superb researcher, has unearthed quantities of new material and crafted them into the illuminating, authoritative portrait of Vanderbilt that has been missing for so long. . . .
At times, the chronicle of Vanderbilt's exploits can read like a long parade of steamboats and locomotives chugging past the reader. Thankfully, the parade is interspersed with entertaining accounts of Vanderbilt's chilly, awkward relations with his longsuffering first wife, Sophia; his 13 children; his spiritualist medium friend and probable mistress, Tennessee Claflin; and his better-loved second wife, Frank Crawford Vanderbilt. The other major characters in Vanderbilt's life were his allies and opponents in epic business clashes, especially financiers Jay Gould and Daniel Drew. These clashes, intricate as military operations, are important bits of financial history, filled with human drama." "Especially now, the world has misgivings about unbridled American capitalism. But let us not forget that the foundations of the greatest economy on earth were laid timber by timber, railway sleeper by railway sleeper, by capitalists who fought for business often with bare fists and only the vaguest notions of fair play. "Cornelius Vanderbilt was the toughest of the lot. With his hard nose protruding like a ship’s prow, and his hands leathered from a youth spent piloting his cut-price ferry into Manhattan, he took to business as if it were war. . . .
"It is the description of Vanderbilt’s legacy to American capitalism . . . that makes T.J. Stiles’s long but superbly written and researched book worthy of its subject. Mr Stiles made his name with a biography of the Confederate train robber, Jesse James. With Vanderbilt, a New York robber baron on the other side of the tracks, he tackles the economic divisions in America as well as the social ones. . . .
"If this makes for good economic and social history, what brings life to the personal narrative is his relationship with the scheming gang of steamboat and railway owners who are at times Vanderbilt’s partners, at times his enemies. When they trick him, as they often try, he is relentless—and ruthless—in getting revenge." "In 1860, the New York Times identified the character of Cornelius Vanderbilt as a symptom of how capitalist competition had ruined American morality. But when a shrewd biographer probes that character with the advantage of historical hindsight, he discovers a surprisingly engaging figure. As he did in his much-acclaimed Jesse James (2002), Stiles limns the meteoric career of an impetuous spirit. Rich in detail, the narrative reveals much about not only the unschooled genius who conquered a commercial world but also the national culture helped transform through his triumph. The very archetype of the rugged American individualist, Vanderbilt blazed his way up from his lowly job as a ferryman to a lofty post as commander of a huge fleet of steamships. But it was by parlaying his steamboat success into a railroad empire that Vanderbilt left his most enduring imprint, forever transforming American business by forging a new corporate model of financial power. Yet this ruthless corporate titan supported the Union cause in the Civil War with selfless patriotism and then generously underwrote efforts to promote national reconciliation after Appomattox. Perhaps most astonishing, however, are the ways this fierce public antagonist expressed—sometimes fumblingly—softer emotions within his family circle. A landmark study." "A rousing life of the legendary robber baron who was in all the right places at the right time. Cornelius Vanderbilt—called the Commodore in his day—rose from a common birth, the child of a Staten Island farmer, to control one of the largest fortunes in world history. Popular historian Stiles (Jesse James: Last Rebel of the Civil War, 2002) writes that although he was derided as an arriviste in his own time, 'illiterate & boorish,' Vanderbilt was actually a man of much substance. The author credits him with being farsighted enough to envision the deeply hidden architecture of capitalism and to understand the importance of transport, the source of his earliest successes, in the new world system. Moreover, Stiles observes, he 'saw that a group of men sitting around a table could conjure "an artificial being, invisible, intangible" that could outlive them all'—in other words, the modern corporation, making money out of abstractions. Vanderbilt was ruthless too. Following what some have called the Wal-Mart model, he undercut the competition until they disappeared, then raised his prices to suit himself, a practice for which he was widely disliked. Born shortly after the Revolution and alive into the Gilded Age, Vanderbilt was an innovator in bringing law and politics to bear on his understanding of commerce. He surrounded himself with smart lieutenants, including one who, ordered to allow no free rides on a Vanderbilt ferry, insisted that the Commodore pay full fare. Expanding into railroads, transoceanic vessels, communications and many other realms and conquering nearly every economic opponent he confronted, he also founded something that Americans 'had long thought to be the corrupt artifact of the aristocratic societies of Europe—that is, he started a dynasty.' An exemplary biography and highly readable business history." It was the trial of the century. 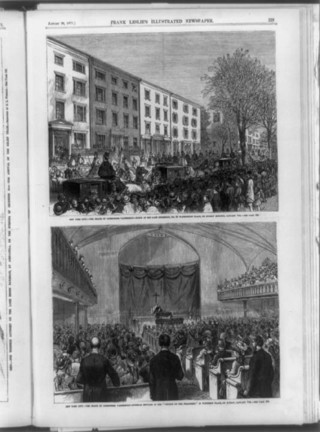 In November 1877, the Surrogate Court of New York began to hear testimony in a dispute over the will of Commodore Cornelius Vanderbilt, the richest man the United States had ever seen. Of his estimated $100 million estate, he left approximately 95% to his oldest son, William Henry Vanderbilt, who had been serving as operational manager of his business empire in recent years. But the Commodore had nine other living children; and one of them, Mary Vanderbilt La Bau, sued to break the will. The trial went on for more than two years before the judge (called the "surrogate") ruled in William's favor. But Mary had had a difficult case to make. She argued that her father, a man famous for his iron will (no pun intended), who had defeated countless business enemies in high-stakes combat, who meticulously arranged his affairs, was unduly influenced by William. In essence, she had to argue that her father was weak-minded. What's surprising is not that she lost, but that the surrogate allowed the trial to drag on for so long. With such a vast fortune at stake, reporters flocked to the courtroom. Their stories ran on the front page for months; even after the trial had dragged on for more than a year, the press devoted a great deal of space to it. Even more exciting, from the reporters' point of view, was the salacious nature of much of the testimony. Mary's lead attorney, Scott Lord, tried virtually everything possible to make his case. He brought in witnesses—or tried to, at least—who testified to Vanderbilt's apparent desire for other women, his interest in spiritualism and magnetic healing, and his private interactions with his family. Indeed, the testimony at the trial later became a major source for biographers and historians, who have drawn on it heavily to paint the Commodore as a great eccentric. This is understandable, because Vanderbilt left no diary and few papers. In the eagerness to paint a colorful picture, though, many of these writers have been extraordinarily careless. In many instances, attorney Lord made claims on his own (asserting, for example, that Vanderbilt had said he had been "insane about money all my life," a quote for which there is no other source). Often he declared what his witnesses would say in testimony, but the surrogate prevented the witnesses from taking the stand. Lord's unsubstantiated claims in these cases have often been recorded by modern writers as if they were factual, or the words of witnesses, when they were, in fact, mere declarations by a hired advocate. In other cases, writers have not put the will trial testimony in historical perspective. For example, there is very good reason to believe that Vanderbilt did, in fact, go to spiritualist mediums and magnetic healers. It's important to remember, though, that this was the high point of both beliefs in American history. As one noted doctor testified at the trial, many of the most intellectual men in the country at that time believed the same things the Commodore did. The will trial is certainly useful as a source. There were many witnesses who provided remarkable first-hand testimony, and showed signs of being truly trustworthy. Vanderbilt's son-in-law Daniel B. Allen, his doctors Jared Linsly and William Bodenhamer, and his treasurer Edwin D. Worcester, for example, clearly did not tilt their testimony one way or the other, as they gave evidence that could be of benefit to both sides. But many other witnesses seem strikingly unreliable, flailing helplessly when they were cross-examined. These tended to be witnesses called by Lord, and they gave some of the most outlandish testimony about the Commodore. In the end, as I have said, William won. He then increased (in some cases doubled) the inheritance of his siblings, as a gesture of reconciliation. But he could not erase the record of the trial, which would be mined for centuries to come by careless writers, more interested in a colorful picture the Commodore than an accurate one. But the Commodore was colorful enough without stretching the truth. I argue that Cornelius Vanderbilt may well have been the single most important businessman in American history. Yet he has never received a full, authoritative biography. Perhaps as a result, most of the historical writing about him has been, frankly, terrible. Here is my take on some of those books. First I'll tackle books that prominently feature Vanderbilt, then I'll cover the very few biographies. The most recent book that centers largely upon Vanderbilt is Stephen Dando-Collins's Tycoon's War: How Cornelius Vanderbilt Invaded A Country to Overthrow America's Most Famous Military Adventurer (New York: Da Capo, 2008). This book is an excellent example of the trouble that can ensue when a desire to tell a vivid story overrides scholarly care and skepticism. With regard to Vanderbilt, Dando-Collins relies heavily upon the most unreliable sources, and where those books fail him, he appears to have simply made things up. Dando-Collins's relatively few endnotes show a heavy dependence on Arthur D. H. Smith's Commodore Vanderbilt: An Epic of American Achievement and, to a lesser extent, William A. Croffut's The Vanderbilts and the Story of their Fortune. Croffut's work can be useful, if used warily, but Smith's book is essentially a work of fiction (Smith himself was a novelist). Large swathes of Smith's account are pure invention, including all of its abundant dialogue. Unfortunately, Dando-Collins draws most heavily upon precisely the most groundless parts of these books. Dando-Collins uncritically accepts virtually anything that might make his story more colorful. For example, he bases much of his interpretation of Vanderbilt's efforts on an utterly apocryphal letter he supposedly sent to Cornelius Garrison and Charles Morgan, about how he would not sue, but would "ruin" them. In fact, he never wrote any such letter; Vanderbilt did send a letter to the press, in which he threatened to sue—and he did sue soon afterward. Later, though Dando-Collins skips over this, Vanderbilt became outright friends with Garrison and Morgan. I suppose I should not blame Dando-Collins for accepting the standard account of Vanderbilt's involvement in Central America. But I looked into readily available sources, especially at the National Archives and the New York Public Library, that completely overturn our established ideas about this episode. With his emphasis on writing a fast-paced story over doing actual archival research, Dando-Collins has failed his readers. An earlier but very popular book that deals heavily with Vanderbilt is Barbara Goldsmith's Other Powers, a book that centers on Victoria Woodhull. Goldsmith treats Woodhull leniently, even accepting at face value her claim to be a medium, in contact with the dead. Given her attitude, she accepts the exaggerated or downright fraudulent claims by Woodhull and her sister, Tennessee Claflin, with regard to Commodore Vanderbilt, who was briefly their friend. Goldsmith's account is sometimes garbled (she confuses the New York Central with the Central Pacific railroad, for example), but her lack of skepticism about Vanderbilt's real relationship with Woodhull and Claflin is her greatest downfall. The most recent biography of Vanderbilt is Edward J. Renehan's Commodore: The Life of Cornelius Vanderbilt. In my opinion, this book was not successful as a biography. I would not have mentioned it in my own book, except it makes huge claims about Vanderbilt, claims that must be addressed. It is poorly written, scarcely annotated, and filled with factual errors. When looking at its few endnotes, I could not verify the very existence of some of its sources, and found that Renehan mischaracterizes a number of those I could identify. The huge claims made by Renehan are that (1) Vanderbilt frequented dockside whores; (2) he contracted syphilis early in life; (3) he began to go insane from syphilis in 1868, as manifested by his relationship with Woodhull and Claflin; (4) his son William used him as a puppet during the Commodore's final decade, while he secretly ran the family empire; and (5) the Commodore died of syphilis. He bases these claims upon purported diaries by Vanderbilt's doctor and a minor business figure from his late life, which he claims to have discovered in private hands. I won't go into details here—for those, read my bibliographical essay, starting at the bottom of 581. Suffice it to say that in all my research into Vanderbilt's late life, I came across not one item that corroborates Renehan's claims. I examined thousands of interviews with newspaper reporters, private letters, business records, letters by his own children, and other primary sources. In all of them, Vanderbilt appeared to be not only sane, but in full command of his empire. Renehan's claims are about as plausible as, say, a claim that someone had found Lincoln's doctor's diary, and it showed that the Great Emancipator was five feet tall and only spoke French. Someone other than the doctor would have noticed. Even more curious, Renehan refused to reveal the names of the owners of these purported diaries. He claimed that he had promised them confidentiality, an arrangement I have never heard of before with regard to owners of historic papers. From what do they need protection? Potential buyers of these valuable papers? Finally, Renehan admitted in 2008 to the theft and sale of letters written by George Washington and Abraham Lincoln that were owned by the Theodore Roosevelt Association, at the time when Renehan was the acting executive director. He was sentenced to 18 months in federal prison. He claimed bipolar disorder as his defense, claiming that it distorted his judgment, making him feel invulnerable. Though this episode does not directly relate to his book, he committed his crimes at the time he was writing Commodore. Together with his claim that he suffered from mental illness that made him criminally reckless, it certainly adds to the already serious questions about the very existence of the purported sources behind his huge and untenable claims. The only serious biography of Vanderbilt dates to 1942. It is Wheaton Lane's Commodore Vanderbilt: An Epic of the Steam Age. Lane was a serious historian, one who avoided the finger-pointing and harshly political condemnation of Vanderbilt of the populist era. His book provides what is still (apart from my book) the only credible account of the Commodore's life. That said, it is nearly seventy years old. The research and historical sense of the context are seriously out of date. Lane segments Vanderbilt's business operations by chapter, so he leaves little sense of the intensity of his career, as he pursued multiple enterprises simultaneously. He often draws highly questionable claims or dialogue from unreliable sources. Finally, he offers no endnotes, simply a bibliographical summary for each chapter, so many of his points remain unverifiable. Clearly there was a need for a complete and authoritative account of Vanderbilt's life. I hope I've provided it. By following Jesse James with The First Tycoon, I am turning from a train robber to a robber baron—from a furtive figure, living outside the law, to a titan at the center of American affairs for half a century. To me, at least, the transition makes perfect sense. I try to write the kind of book I like to read. My ideal work of nonfiction follows a classic formula: It both informs and entertains. As a historian, I try to draw out the larger meanings. I am drawn to topics that speak to the creation of modern America, that highlight the major themes of the nation’s history. I also hope to say something new about them. As a writer, I look for interesting characters, dramatic lives, complicated human relationships. I try to give the reader a reason to turn the page—every page. In short, I like big questions and good stories. In the life of Cornelius Vanderbilt, like that of Jesse James, I found a larger-than-life subject badly in need of a new biography. And I found a subject whose life revolved around themes that I had hoped to deal with in my first book, but found did not belong there. 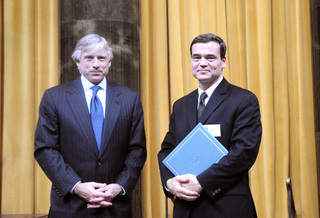 In an address to the 2008 meeting of the Business History Conference, historian Richard White observed that there are two great topics of nineteenth-century American history: the Civil War and Reconstruction, and the rise of the corporation. I began work on Jesse James with the notion that the first topic defined James’s life, but I believed I would grapple with the second as well. Surely, I thought, his reputation as a Missouri Robin Hood reflected popular resentment of the railroads—the specific business that introduced the big corporation into American life. But I was wrong. Rarely does a historian discover that his initial thesis is far more on the mark than he had anticipated, but such was my experience. The evidence was virtually unanimous: Jesse James was not an anti-railroad social bandit, but the Last Rebel of the Civil War. At the same time, in pursuing James’s career as a bank and train robber, I began to dig into business and economic history—the financial system, the railroad corporations, the express companies—and the political questions that swirled around the changing economy. So when I contemplated a new biography, I naturally turned to the man who towered over the railroad system—indeed, the American economy as a whole—during the same period: Cornelius Vanderbilt. Vanderbilt has been in dire need of a new and complete biography. The last serious study was published in 1942: Wheaton Lane’s Commodore Vanderbilt: An Epic of the Steam Age. Lane’s work has stood up extremely well, but it is also nearly seventy years old. More than that, it is emphatically a business biography. Lane paid little attention to Vanderbilt’s larger social, cultural, and political significance, let alone his complicated personal life. I expected to complete The First Tycoon two years after I started work on it at the beginning of 2002. I soon discovered that it would be impossible. Vanderbilt’s career began before the War of 1812 and lasted until the end of Reconstruction, marked by deals with John D. Rockefeller and other giants of the industrial age. He stood at the center of the public stage from 1824, when he played a key role in the landmark Supreme Court case Gibbons v. Ogden, through the California gold rush and the Civil War, to the rise of Wall Street, the railroad, and the giant corporation. And yet, much of his life has never been explored before. I found (sometimes by accident) dozens of archives filled with details about him and his businesses, as well as thousands of press reports that discussed his activities and debated his impact. So the research went on, year after year. It was frustrating, and it was thrilling. I discovered previously unknown episodes in his life: Fistfights, steamboats deliberately ramming each other, expeditions into the Nicaraguan jungle, secret agents on dangerous missions, family turmoil, political intrigue, and secret business deals recorded in letters marked “Burn this immediately” (an instruction I’m very happy the recipient ignored). He was everywhere in the nineteenth century, from the international stage to hidden corners where no one had looked. I found that I had to rewrite and rewrite to bring his significance into focus. In an era of starkly limited government, a businessman of Vanderbilt’s stature occupied the intersection of the main public currents of the day. His life spoke to the great debates over opportunity and equality, over the need for economic development and fears of an aristocracy, and he was a subject of fierce controversy. And he played an important personal role in the conduct of the Civil War, the struggles over government corruption, the incredible growth of the American economy, and the polarization of society through the emergence of great private fortunes. The questions that drove me in writing The First Tycoon go to the heart of American culture, politics, and identity. How have the people of the United States grappled with the collision between opportunity, liberty, and equality? Why did corporations, rather than the government, construct so much of the nation’s transportation infrastructure? Where did the notorious corruption of the nineteenth century come from, and how did Americans deal with it? How did government regulation of the economy emerge? How did the giant corporation come to dominate the economy of a country that had been largely rural and agrarian? How did Americans come to grips with the abstractions of securities and financial markets? Too often, books that address business figures tend to moralize on one side or the other. Depending on which polemic you pick up, you will read that Vanderbilt was either a merciless, manipulative robber baron or a heroic captain of industry. By contrast, I hope to provide an honest assessment that examines him in the full context of his times. That context was so different from our own that the results are sometimes surprising. When the robber-baron metaphor was invented (specifically for Vanderbilt), it was part of a political framework that simply makes no sense in the twenty-first century. Readers will (and should) draw their own conclusions about whether Vanderbilt was admirable or the opposite, but I hope they will agree, after reading my book, that he was truly significant. The intimate details of Vanderbilt’s life have remained even more obscure. Since he left no collection of papers, much of what has been said about him has been based on apocryphal newspaper accounts, particularly his obituaries. The most sensational claims have drawn on the great trial over his will, when one daughter tried to annul his intention to leave the bulk of his fortune to his oldest son, William H. Vanderbilt. Based on this evidence, he has been depicted as a rapacious, illiterate brute, an overreaching dictator in business and a tyrant loathed by his family. I found that much of this evidence did not stand up to scrutiny. Many of Vanderbilt’s most famous quotes were not spoken by witnesses, but by the lawyers who were trying posthumously to prove his instability. Other quotes were simply invented by the press. Vanderbilt famously had a friendship with Victoria Woodhull (who ran for president in 1872) and her sister Tennie C. Claflin, who were spiritualist mediums, magnetic healers, and activists for women’s rights. Unfortunately, much of what has been written about their relationship has been based on the words of Woodhull and Claflin themselves, who lied freely to the press. Vanderbilt could be colorful, even eccentric. He was interested in spiritualism and magnetic healing, but this was entirely ordinary in the decade that followed the Civil War, when thousands of Americans tried to contact the dead or avoid conventional physicians’ doses of mercury and rounds of bloodletting. He was a domineering man of fierce will, but he also prized his honor, stood by his word, and practiced patient diplomacy throughout his career in railroads. In letters written by his children, and in those in his own hand, I discovered a man of great emotional complexity. A man of action, he suffered for his awkwardness in navigating the turbulent emotional waters of everyday life. He set high standards for his sons, who struggled to meet them. His middle son, Corneil, is the tragic antihero of Vanderbilt’s story, a man stricken with epilepsy and addicted to gambling, arousing Vanderbilt’s frustration, compassion, and despair. And the Commodore deeply loved his two wives, Sophia and Frank. He apologized to Frank for afflicting her with his short temper during his final, fatal illness, but he also demonstrated wit and fortitude to the end. Few individuals have had such a profound impact on American history. As I write in my book, no one person can single-handedly move the national economy and culture—but it is hard to think of anyone who had his hand on the lever for so long, or pushed so hard, through so formative a period. Admired, feared, resented, Vanderbilt always commanded respect, even from his enemies. The last serious biography of Commodore Vanderbilt was published in 1942, and even it was not a comprehensive account of his life. Not surprisingly, I was able to find a great deal of new information about Vanderbilt's life, much of which overturns long-standing assumptions about his career. Here's a quick list. • Vanderbilt moved to Manhattan during the War of 1812, settling on Broad Street in an artisans' boarding house. • He moved to establish himself as a general merchant, in partnership with his father and brother-in-law. • He was hired by Thomas Gibbons, his only employer, by accident, when Gibbons's steamboat captain suddenly disappeared. Both Gibbons and Vanderbilt thought it would be for only a few days—not nine years, as would be the case. • Vanderbilt did not sell out all his sailboats, but kept his own enterprises running during his work for Gibbons, and even built new schooners and periaugers. • He took an interest in horse-racing early on, in what would be a lifelong passion. • As Gibbons appealed his case against the Livingston steamboat monopoly to the Supreme Court, in what would be the first commerce-clause case in the court's history (Gibbons v. Ogden, 1824), Vanderbilt fought his own case against the monopoly to the Supreme Court. Vanderbilt v. Livingston was next on the docket after Gibbons v. Ogden. • Vanderbilt went entirely on his own when his employer (William Gibbons, son of the late Thomas Gibbons) panicked over the appearance of corporations in the steamboat business, a new development in American business history. • Vanderbilt adopted the rhetoric and philosophy of radical laissez-faire Jacksonian Democrats in the 1830s, as he competed against corporations and monopolies on the Hudson River and Long Island Sound. • He loaned large amounts of money to other businessmen, and became a major real-estate investor in Manhattan and Staten Island. • Vanderbilt took over the Staten Island Ferry in 1838 after a major scandal, in which its president, Oroondates Mauran, ordered his boat captain to ram and sink a rival ferry run by Vanderbilt's cousin Oliver. • Vanderbilt and Daniel Drew formed a secret partnership, in which each man invested in the others' enterprises, in order to provide an incentive to avoid competition. • Vanderbilt became heavily involved in the railroad industry in the 1840s, and took the presidency of his first railroad, the Stonington, in 1847. • He began to spend each summer in fashionable Saratoga Springs no later than 1840, and joined the New York Yacht Club soon after it was organized. • Vanderbilt sent his second son, Corneil, to California at the start of the gold rush, hoping it would offer him a start in life. Instead, he became a gambling addict. • Vanderbilt's partner in his attempt to build a canal across Nicaragua, Joseph L. White, proved treacherous almost from the beginning, and would be his most persistent foe through the end of the 1850s. • Joseph L. White betrayed Vanderbilt by lying about the willingness of British investors to invest in the canal, even as White sold canal stock. Vanderbilt's desire to get revenge on White shaped much of his dealings with the canal company, and Accessory Transit, the corporation he set up to carry passengers across Nicaragua. • During a grand tour of Europe in 1853, Vanderbilt was betrayed by White (again) and Charles Morgan (not Morgan and Cornelius K. Garrison, as is usually thought), who cut off the flow of money owed to Vanderbilt from Accessory Transit. • Vanderbilt was cheated out of $600,000 by Robert Schuyler, a prestigious member of a patrician family, who had worked closely with Vanderbilt over the previous two decades. Schuyler carried out a major fraud that was the scandal of the decade. • In late 1855, Vanderbilt started to buy control of Accessory Transit once again, as part of a plan to create a monopoly on California steamship traffic, in conjunction with the Pacific Mail Steamship Company. • When filibuster William Walker invaded Nicaragua in 1855, Walker's friend Edmund Randolph manipulated Cornelius K. Garrison into betraying Accessory Transit, along with Charles Morgan. At that moment, Vanderbilt was buying control of Accessory Transit, though Garrison did not know it at the time. Indeed, Garrison had refused to help Walker until he was forced to by Randolph. • A little-known Accessory Transit official in Nicaragua, Joseph N. Scott, refused to hand over the company steamboats in Nicaragua to Hosea Birdsall, Vanderbilt's agent. Scott was owed money by the company, and he refused to cooperate until he was repaid. As a result, Garrison and Morgan were able to take control of the steamboats and start a transit line, which carried reinforcements from the United Staets to Walker's army in Nicaragua. Had Scott complied with Vanderbilt's orders, Walker would have fallen from power, and a major war costing tens of thousands of lives would have been averted. • Vanderbilt eventually seized the steamboats with the help of a secret agent named Sylvanus Spencer. As a first mate on the high seas, Spencer had almost certainly murdered his captain, though he was acquitted because no one had seen him do it. • Vanderbilt tried very hard to restart the Nicaragua transit line, urged on by President James Buchanan. He was stymied by the manipulations of Joseph L. White, a confidence artist named William R. C. Webster, and William Walker, whose repeated attempt to reconquer Nicaragua frightened the authorities there away from reopening the transit route. • Vanderbilt eventually created a monopoly on California steamship traffic by forcing Pacific Mail to come to terms, dividing the Pacific and Atlantic oceans between them. • He was immensely fond of Ellen Williams, his son Corneil's wife, and personally wrote notes to her family, expressing fondness for them. 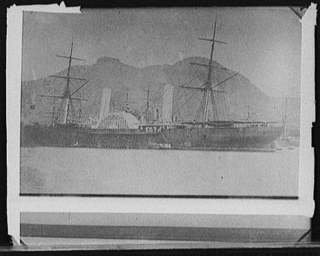 • Vanderbilt tried to donate his largest ship, the Vanderbilt, to the Union navy, but was turned down by navy secretary Gideon Welles. He was able to only after the Confederate ironclad Virginia frightened Lincoln and his administration into seeking Vanderbilt's help. • Vanderbilt's third son, George Washington, was court-martialed at the start of the Civil War, returned to duty, and never saw combat. He fell ill when running a recruiting station in Boston, and died in France. • Vanderbilt took over the Harlem railroad in 1863 as a hobby, hoping to show that he could turn a company widely thought to be worthless into a profitable enterprise. • Daniel Drew did not fight Vanderbilt in the first Harlem railroad corner on Wall Street, in 1863. 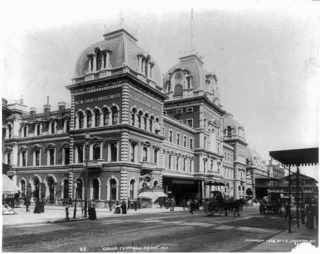 • Vanderbilt did not take part in the Hudson River Railroad corner, but rather slowly purchased control, taking over the company in mid-1864. That takeover set the stage for Vanderbilt's conflict with Drew, who operated a steamboat line on the Hudson. • Vanderbilt emerged as a consummate corporate diplomat in the railroad business. He did not set out to conquer an empire, but sought accommodation, fighting and acquiring connection lines only as a last resort. • Jay Gould first approached Vanderbilt in late 1867, asking for help in throwing Daniel Drew off the Erie Railway board of directors. Vanderbilt agreed, hoping to prevent Drew from driving down stock prices and injuring the money market, as Vanderbilt bought control of the New York Central Railroad. • Vanderbilt launched his failed corner of Erie stock in 1868 not to buy control of the company, but to take revenge on Drew, who had betrayed him and his friends in a joint operation in Erie stock. • Vanderbilt contributed to the Black Friday panic of 1869, when he deliberately crushed the stock price of the Lake Shore railway, in a successful attempt to drive out a rival named LeGrand Lockwood, who was allying the Lake Shore with Jay Gould's Erie Railway. Vanderbilt then stepped in to arrest the panic and stabilize stock prices. • Vanderbilt was proud of his second wife's Confederate beliefs, and even had Confederate General Braxton Bragg as a witness at their wedding. Most of Vanderbilt's late-life charity was aimed at helping the defeated South after the Civil War. • The Commodore came to be accepted by patrician New York society, and was dubbed "an honorable and high-toned gentleman" toward the end of his life. • Vanderbilt closely supervised his railroad empire even when on his deathbed. He saw the Panic of 1873 coming, and managed to save his empire from near disaster. • Despite his disdain for Corneil's weaknesses, he never turned away from his son, and held out hope that he could reform himself. • Vanderbilt's estate was worth at his death one out of every twenty dollars in circulation, including cash and bank deposits. Click for the Media Center, featuring interviews with T.J. Stiles. The First Tycoon: The Epic Life of Cornelius Vanderbilt is a serious look at Commodore Vanderbilt and his impact on the broader landscape of American history. Unfortunately, most of the writing about Vanderbilt has been based on apocryphal sources or even raw fictionalization. As a result, the standard accounts of his life are riddled with myths that don't hold up. What follows is a list (probably incomplete) of misconceptions that I overturn in the book. Note that not all are mentioned explicitly in the book; I simply left out a lot of stories that I came to believe were false. So here it is, a portrait of who Vanderbilt was not. Each of these statements (organized by section of the book) is false. Vanderbilt was a boor who chewed tobacco, drank heavily, and spat on carpets. Vanderbilt and Daniel Drew were enemies. Vanderbilt's only maneuver on Wall Street was the corner. Vanderbilt was a corrupt chief executive who hurt his own stockholders to make personal profits. Vanderbilt was an unfeeling brute who abused his family, especially his epileptic son Cornelius Jeremiah. Vanderbilt contracted syphilis in 1839, began to suffer dementia in 1868, and was used as an uncomprehending puppet by his son William H. for the rest of his life. Vanderbilt sold all his sailboats to learn the steamboat business. Vanderbilt was first given the informal title of "Commodore" as an insult. Vanderbilt sent his first wife, Sophia, to an insane asylum when she refused to move to Manhattan from Staten Island. Vanderbilt made every nickle of his fortune from transportation. Vanderbilt was a member of the Whig Party. Vanderbilt helped invent the potato chip. Vanderbilt's son Cornelius Jeremiah ran off to California at the start of the Gold Rush. Vanderbilt supported filibuster William Walker's invasion of Nicaragua in 1855. Vanderbilt made no attempt to reopen the Nicaragua transit route after William Walker destroyed the Accessory Transit Company in 1856. Vanderbilt said, "I have been insane on the subject of money-making all my life." Vanderbilt called Jay Gould "the smartest man in America." Vanderbilt's son William Henry made the bulk of the Vanderbilt fortune. Vanderbilt gave financial backing to Victoria Woodhull & Tennessee Claflin, who were the first female brokers on Wall Street. Vanderbilt promised to marry Tennessee Claflin after the death of his first wife, Sophia, but was prevented from doing so by his family. Vanderbilt wanted to get control of the Erie Railway to monopolize New York's railroads. Daniel Drew brought Jay Gould and Jim Fisk into the Erie Railway. Vanderbilt bribed judges and legislators wholesale in the Erie War. Vanderbilt lost the Erie War. Vanderbilt once said: "Law? What do I care about the law? Hain't I got the power?" Vanderbilt methodically attempted to monopolize New York's railroads. Vanderbilt threw George Westinghouse out of his office, refusing to believe that his air brakes for trains could possible work. Vanderbilt's behavior in the last decade of his life was erratic. The roof of Grand Central's train shed collapsed the day Vanderbilt died. Vanderbilt left his entire estate to his oldest son, William H., and disinherited his other children. None of the above is true. Each is a myth. Click to find The First Tycoon at your local independent bookstore.